Last night's Pride edition of the TOY party at The Week with DJ Chris Cox was everything I expected and more. 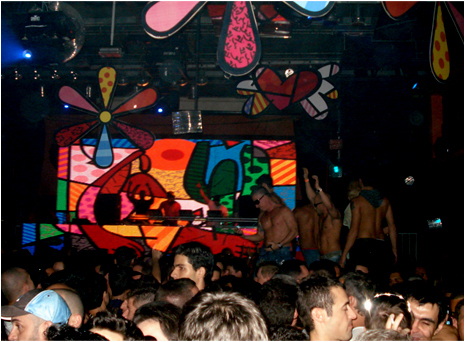 The decor was entirely inspired by the work of Brazilian Romero Britto, and even the led panel installed behind the DJ booth featured images based on Mr. Britto's colorful paintings. As strange as it may sound, it was the perfect backdrop for a party that was all about having fun. At a certain point in the evening the club was transformed into a big gay circus. Go-go dancers were substituted by circus performers, and the patio turned into a stage for a trapeze show. Watch it on the video below. I had plans to also hit Flexx last night, but the party at The Week was so good that I ended up staying at the club all night. The house was pretty full but I found a spot to dance on the outdoors area, and had a blast. For more pictures of TOY at The Week (and the go-go boys), check out the photo gallery below.